What gave you the idea to write Dark Promise? Julia: The book was actually Talia's idea. She had been wanting to write a faerie book, and we had recently co-written Mesmerized so she asked if I wanted to write it with her. Talia: The very beginning of the book just came to me one day. I knew what I wanted to do, and I asked Julia if she was interested in writing it with me. 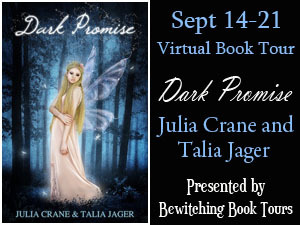 Which character did you enjoy writing the most in Dark Promise? Julia: Kallan was definitely my favorite. I always like the bad boys that fall hard for the girl. Talia: I like writing for Rylie. I really put myself into my main character. Can you explain your book in less than 10 words? Julia: A dark stranger turns Rylie's life upside down. What type of books do you usually read/enjoy reading? Julia: My taste is all over with books. I really enjoy psychological thrillers, and I love YA books. Talia: Young adult mostly. Sometimes I read medical thrillers or romance, but not often. Julia. I would have to say Atlas Shrugged or Fountain Head by Ayn Rand. Talia: That's hard. The Little Prince is my all time favorite book, but I have so many others that I consider favorites. Julia: I just finished Awry by Chelsea Fine. Talia: I just had a baby, so I've been really busy. Unfortunately, I haven't had the time to read lately. I have about 20 books downloaded to my Kindle to read. I can't wait to start! Julia: I just want to say thank you for taking the time to offer the book blogging service to authors. Talia: Yes. Thank you so much for posting this. My mother led her into the living room. The lady’s piercing green eyes rested on me, sending a chill down my back. My father followed her gaze. “Rylie, do you know this woman?” Dad asked. “Rylie, maybe you should go to your room,” Dad suggested, his gaze demanding I do as he said. “No. If this has something to do with me, I want to hear it.” I crossed my arms and sank against the back of the couch. I felt like I had fallen into some kind of parallel universe. Did this woman just say she was my birth mother? How could she be my birth mother? That would mean I was adopted, but wouldn’t my parents have told me something like that? The wind left me as if I had been punched in the stomach. I couldn’t breathe, and the room spun. I gripped the pillow next to me with my other hand as I clung to my mother. “No! This is preposterous! Nobody died. Rylie is ours.” Dad’s voice was like thunder. I studied the lady. She seemed so honest and soft-spoken. Why would she pretend something like this? Why would she ruin our family if it weren’t true? And if was true, why was she coming clean now? Something in me believed her even though I didn’t want to. I swallowed hard and rubbed my sweaty palms on my shirt. “Let her talk,” I said hoarsely. “Rylie, you can’t believe her.” Dad looked stricken. “I’m curious as to why she thinks I’m her daughter. Let’s hear her out.” I crossed my arms and scooted closer to my mother, comforted when she wrapped an arm around me. “Thank you. I’m going to tell you something not many humans know, and I have to trust you to keep it secret for Rylie’s sake.” She addressed the statement to my parents. Humans? Who talks like that? Julia Crane is the author of the YA paranormal fiction novels: Keegan's Chronicles, Mesmerized, Eternal Youth, and Dark Promise. 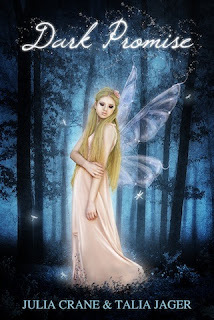 She was greatly encouraged by her mother to read and use her imagination, and has believed in magical creatures since the day her grandmother first told her an Irish tale. Julia has traveled far and wide to many of the places her grandmother told her about, gaining inspiration from her journeys to places like Nepal, Cyprus, Sri Lanka, Italy, France and many more. And who knows? Maybe the magical creatures she writes about are people she met along the way. Keep updated by joining her mailing list. Thanks for having us on your site. I love your blog it looks great! Thank you! It was a pleasure having you! Great interview! Will be reading this book soon!